#anotherearthart is a feature in which we get people to tell us which artwork or fashion image they’d choose if they had to leave earth today and go to a brand new world empty of all our art. The idea being to find out more about people through their artistic interests. That and to look at some nice images. Until about a month ago, my encounters with Van Gogh had been brief and unimportant. I had seen the landscapes and portraits of emphatic strokes and vibrant colours as a child, and had thought very little other than that they were strange and untrue to life. It wasn’t until taking up The World of Van Gogh by Robert Wallace (a brilliant biographical account of the artist accompanied by A4 pictures of various paintings) that I formed my own very personal bond to this art. I came to understand vividly that during his life, Van Gogh was an incredibly lonely man of incinerating passion and a diabolical bent for expression. He painted what he felt, and felt and painted with the same ferocity as met his earlier religiosity and his almost demonic courting of women; he would sleep on the cold floor of a shed for weeks, and live on crusts for his commitment to religion and love of god, and would mutilate and burn himself to express his love for women. 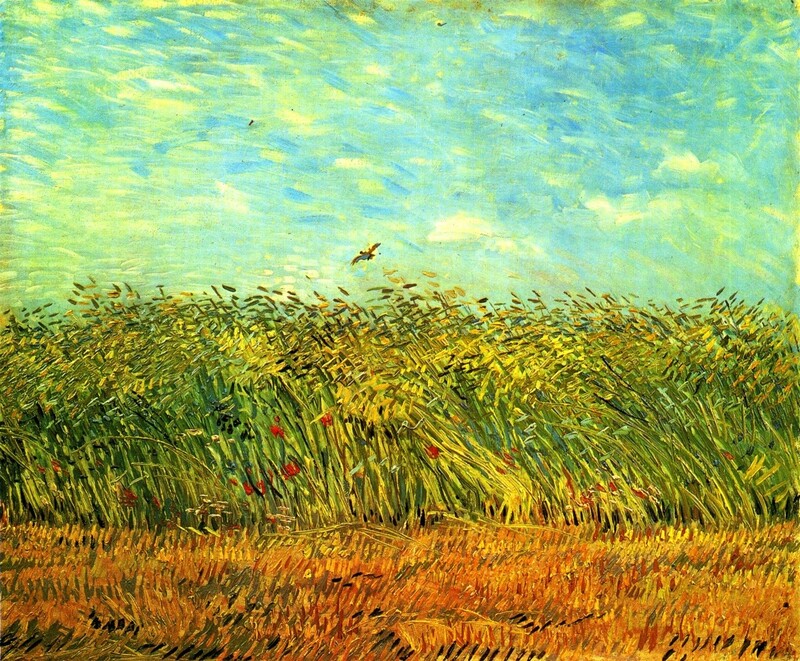 Of all the paintings in Wallace’s book, there was something desolately passionate in Wheat Field with a Lark which perfectly embodied my idea of the man. I could see his overpowering feelings of stifled love in the scorched grass, which looked as hot as flames, and in the sky that singed the wings of a solitary lark. Like most of his landscapes, as they were beginning to appear to me, it was an incredibly intimate self-portrait, which anyone who had loved or felt alone in a beautiful world could appreciate. Now, I always seem to single this painting out from his others. If I had to take an image to another planet, it would be Wheat Field with a Lark, because it reminds me that he had the strength to express himself even when the import of that expression compromised everything else. It’s a reminder that human beings can harbour an emotional intensity to rival any of the phenomena I might encounter far away from earth. Teddy McDonald is a third year English Literature and Creative Writing student at Newcastle University. He writes for the art and film section of the university paper and is keenly interested in fine art, film and literature. I read this article and found it very interesting, thought it might be something for you. The article is called Wheat Field with a Lark – #anotherearthart and is located at http://prancingthroughlife.com/2014/10/21/wheat-field-with-a-lark-anotherearthart/.